The School of Global Communication and Language strives to assist students in attaining strong communication skills in English and Chinese, so that they may have the potential to become successful internationally. In addition to developing communication skills in English and Chinese, cultural awareness, as well as global knowledge, it is also important for students to learn how to solve problems, work in a team, and have proper attitudes and mannerisms when they are working internationally. 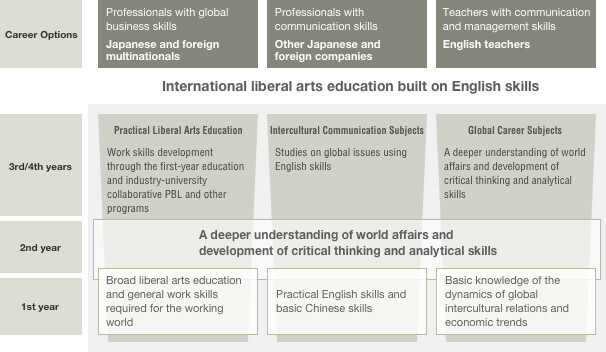 The School of Global Communication offers a curriculum that is described below. First year students start with classes that allow them to become accustomed to university level academics, learn about global trends and patterns, and also improve their English and Chinese skills. Building upon the language skills that students developed in first year, it is required in principle that students study abroad for one semester in an English speaking environment. 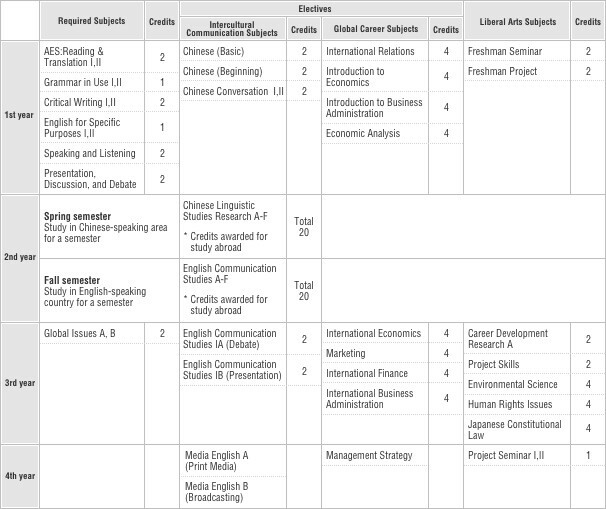 and also study abroad for one semester in a Chinese speaking environment. Studying abroad in second year allows students to refine their language skills in listening, speaking, reading, and writing, experience life in foreign countries and cultures, challenge themselves to breaking through traditional values, and also discover new perspectives and ways of understanding earlier than other university students. Training classes and study abroad programs prepare students for their studies in third and fourth year, where a project-based learning approach is taken and seminars are held to significantly deepen student understandings of subjects including but not limited to economics and international relations. The intensive classes and seminars are provided to allow students to attain the knowledge and the skills required to start working in relevant fields immediately after graduation. * It should be noted that it is necessary for students to have sufficient academic and language skills prior to participating in a study abroad program. In order to reach our educational goals, the School of Global Communication and Language provides the following categories of classes. Specialized Mandatory Classes are designed to guide students in improving their English skills while also learning in general fields and liberal arts. The Advanced English Studies Program (AES) is part of this category. It is composed of ten classes that allow students to gain strong and practical English communication skills, and also develop a firm base of global knowledge. Students are enrolled in five AES classes per semester and attend the classes eight times a week in total during their first year. The classes allow students to reach a good balance between their listening, speaking, reading, and writing abilities, and prepare them for their study abroad program in second year. Specialized Elective Classes provide the means through which students can deepen the skills and knowledge that they have attained in Specialized Mandatory Classes. Topics that are covered include but are not limited to Japanese culture, cultural awareness, international relations, international business, and foreign languages in addition to English and Chinese. By studying in Specialized Elective Classes, students can become more specialized in fields that they are interested in, and also develop strong cultural awareness and a rich foundation of global knowledge. Students are trained in English, Chinese, and Japanese in order to improve their practical communication skills, and also in social studies and cultural studies so that they can communicate with and also understand individuals who are from different backgrounds and cultures. Global Career Classes concentrate on international relations as well as global trends, and aim to increase the global knowledge of students, as well as their ability to critically analyze and think theoretically about current world issues. Students learn deeply about humanities and social studies in General and Liberal Arts Elective Classes, and develop general understandings of behaviors in society that are beneficial when they attempt to build an international career. * The schedule serves an example with only main classes listed. In first year, students concentrate on improving the English and Chinese language skills that prepare them for studying abroad in second year. After returning to Japan, students continue to improve their language skills in third and fourth year, and also study in fields – such as economics, management, and international relations – that they are interested to learn about how societies are composed and operate. The number of approved credits from study abroad programs is to be determined based on student grades and total lecture hours participated in at the host university. One special trait of the School of English and International Studies is the one semester study abroad program that focuses on language studies. The example above shows the typical pattern of students participating in one semester of studying abroad in an English speaking environment and another semester in a Chinese speaking environment. For third year students who have applied to for a one year study abroad program and were unsuccessful, it is possible for them to participate in an addition one semester study abroad program that focuses on language studies. The School of English and International Studies is dedicated to assisting students in becoming professionals who are capable of understanding different cultures, communicating with individuals from other countries, and also challenging themselves in various parts of the world. After earning their degree, students will have the skills and knowledge required to work in global companies and organizations around the world, in various companies and organizations within Japan, and also in the field of education as junior high of high school English teachers. Individuals who succeed in global companies and organizations must not be limited by boundaries and traditional ways of thought, but have the ability and the will to challenge themselves in communicating with others, developing new perspectives, and finding better methods for mutual understanding. Approximately 70% of Japanese companies and organizations are considering the option of global expansion or have already expanded overseas, and such companies and organizations are on the lookout for professionals with cultural awareness and strong communication skills in different languages. English teachers are required to possess not only strong English and management skills, but also extensive international experience with foreign cultures.